Game 1 Highlights: Warriors beat Cavaliers 104-89 (2016 NBA Finals) - Balita Boss! The Golden State Warriors beat the Cleveland Cavaliers 104-89 in Game 1 of the 2016 NBA Finals despite an off-night for Stephen Curry and Klay Thompson. The Warriors' bench came up big and outscored the Cavaliers' reserves 45-10 to take 1-0 lead in the series. 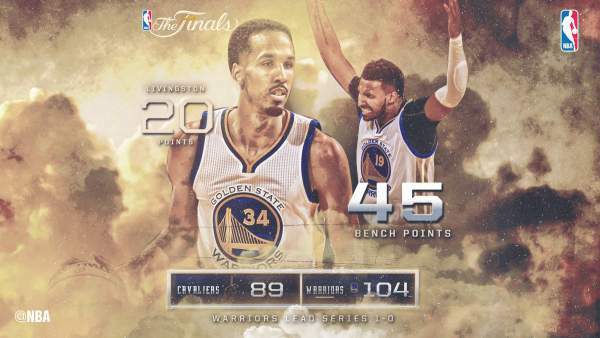 Shaun Livingston led the Golden State who scored a playoff career-high 20 points off the bench. 2015 finals MVP Iguodala had 12 points, seven rebounds and six assists, while Leandro Barbosa tallied 11 points on a perfect 5-for-5 mark from the field. Curry and Klay Thompson struggled, going a combined 8-of-27 but each knocking down a huge 3-pointer in the fourth quarter. Curry finished with 11 points and Thompson only scored nine. LeBron James had a near triple double with 23 points, 12 rebounds and nine assists. Kyrie Irving scored led all scorers with 26 points, 11 on free throws for Cleveland. The Cavaliers shot just 38.1 percent from the field, while Warriors at 49.4% rate. The 17 turnovers of Cavs turn into 25 points for the Dubs. Game 2 is on Sunday night at Oracle Arena (Monday morning in the Philippines).